When educators embrace student-centered learning, classrooms transform, authentic learning comes alive, and outcomes improve. 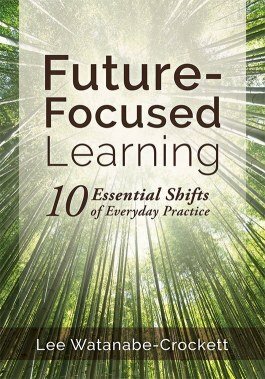 A culmination of Lee Watanabe-Crockett’s ten-plus years of work with schools around the world, Future-Focused Learning details ten core shifts of practice—along with simple microshifts—you can use with your students immediately, regardless of your core curriculum or instructional pedagogy. These proven shifts offer a clear pathway for taking the great work you are already doing and making it exceptional. Learn why fostering connections to learning—from improved emotional connections to personalized learning—improve student-centered learning outcomes and higher-order thinking. Improve formative assessment practices to be more mindful, ask the essential questions, and further student engagement by involving them in the assessment process. Access an exclusive online bonus chapter that examines the value of solution fluency across a range of applications. "Future-Focused Learning takes teachers on a personal learning journey. Lee Watanabe-Crockett speaks directly to teachers, inviting them to shift their practice in accessible and meaningful ways with maximum impact for the students they teach." "Any teacher, from beginner to veteran, will find practical and proven ideas for invigorating their teaching and enlivening student learning." "Future-Focused Learning succinctly summarizes the key shifts happening in education. With a focus on the practitioner, the chapters offer practical suggestions, tools, and activities to nudge educators to embrace these shifts as opportunities to propel their practice."